I bought this cute seersucker fabric last summer, wanting to make a summery top. I was so happy to find this fabric because this seersucker had more cotton content than polyester. Since this pin-dot shirt turned out pretty well, I wanted to make another top using M7544, only this time, less pattern hacking! I used version D with added sleeve ruffles. 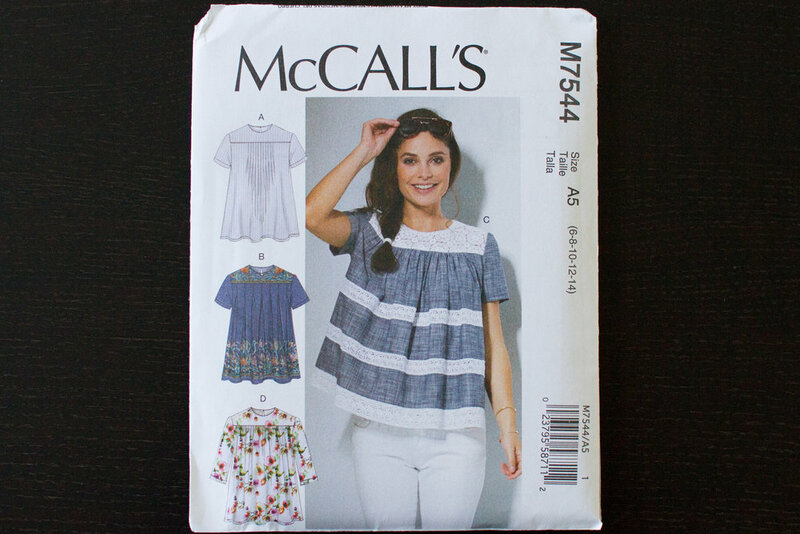 It was quick and easy project and the result is a really cute summer top! Even though the bodice has so much ease, it felt a bit hard to move around my arms. Which I found it odd, considering the pin-dot shirt is so comfortable in any ways. Perhaps because the pin-dot shirt is button up which I think provides more gives. Plus its sleeves are wider. This yellow top is not unwearable though—just wasn't as comfortable as I thought it would be, considering it's such a flowy loose-fitting shape. I didn't sew down the back pleats to give extra movement and it helped a bit. I think the problem (for me) is that the bodice is so wide but the sleeves are pretty slim. I can make them a little bit wider next time to see if that improves with the fit. I could also shorten the sleeves a tad, since they sit right on my elbow right now. Nonetheless, I like this little number. I like how the sleeve ruffles turned out! I especially like it over my Morgan Jeans. They together create a really fun relaxed summery style!